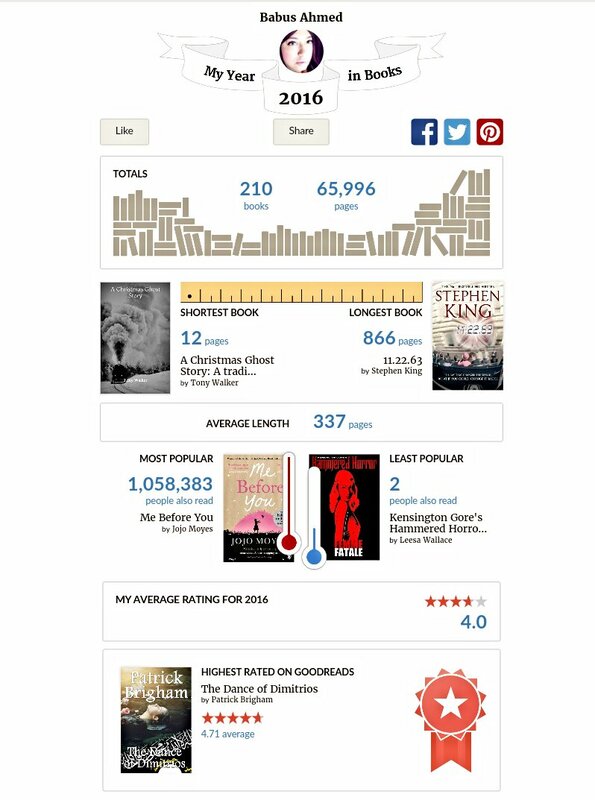 I set my reading goal last year at 180 books and read 210 books in total, falling 25 books short of my 2015 total. Into this figure I factored in any events which may have left me unable or not wanting to read for a limited time and I am grateful that I did, as mid year to Autumn I did suffer with worsening health and I had the opportunity to try different things. Despite this I am delighted by the books I read last year and I really did enjoy trying books out of my comfort zone as well as realising I have grown (a bit) as a reader and reviewer. I find myself less generous with star ratings and harder to please but comparatively I think I do enjoy the books I like very much. Joining my local library changed the types of titles I have access to, leaving me with more choice and flexibility. I look forward to discovering many more hidden gems next year as well as tackling some of the more celebrated books of 2016 I did not get to read. My priority this month will be reading books I purchased and have been waiting the longest on my to-be-read pile as well as agonising over my Top Ten Books of 2016. I look forward to another fabulous year in books. 210 books is amazing!! I almost reached 100 reads in 2016 but my reading slump ruined that for me… 😛 Happy New Year! I had a bit of a slump in August. I think it’s an indication I need to be a bit more pickier about books I choose to read. Congratulations on exceeding your reading goal last year! I have decided to read more in 2017. What is the best book you read last year? I hope you have a happy and healthy 2017! Thank you, I have yet to compile my best books of the year, it’s never easy choosing the best book of the year but I hope to have an answer to that soon. I read many more books last year than I posted, because I have a devil of time figuring out how to post on Goodreads. I’d also like to post my blog each week on Goodreads, but that’s way beyond my skill level. Help, please. And congratulations on reading as many as you did, Ajooba. Thank you, I keep an accurate record on Goodreads as I don’t want to accidentally pick up a book I have already read. How do you make time to read so many books? I find it hard to focus after school and work and other life circumstances, but I really would like to read more. I always have a book on the go and I don’t watch much TV. I find reading helps me relax and escape and in all honesty it’s a habit that keeps growing. That is an amazing amount of books! I find reading quite hard and slow going so don’t read as many books as I would like! Looking forward to seeing your best books of 2016! There are readers who read double what I do, but I think you need to find a speed that allows you to enjoy your books. If it wasn’t enjoyable I wouldn’t do it at all. I’ve actually written my post of the top ten books of 2016, so will be publishing it soon.